Blog Page Title: You can Enable/Disable for blog page title. Page Title Settings: This is page title style settings for blog. Here you can set skin settings like font color, link color with hover/active colors, border, padding, and full background settings. Background Parallax: You can Enable/Disable blog, page title background image parallax. Background Video: You can Enable/Disable blog, page title background video here. If you choose Enable then you must set youtube video id for next input box. Page Title Overlay: You can set blog page title overlay color with alpha (RGBA). Page Title Items: Needed blog, page title items drag from disabled and put enabled part like left/center or right. Blog Featured Slider: Enable or Disable blog feature slider. If you enable means just set the slider settings to Sliders -> Blog Post Slider on theme option tab. Article Skin: Choose your page Article skin style for each blog article. You can set font color, link color options, border, padding, and background with alpha (RGBA). Blog Template: Choose your current blog page template. Choose Left Sidebar: Select your widget area for showing blog page on left sidebar. If you want left sidebar you must enable blog template either left sidebar or both sidebar. Choose Right Sidebar: Select your widget area for showing blog page on right sidebar. If you want right sidebar you must enable blog template either right sidebar or both sidebar. Blog Block Model: Choose your block model and edit. Available layouts are Standard, Grid and List. 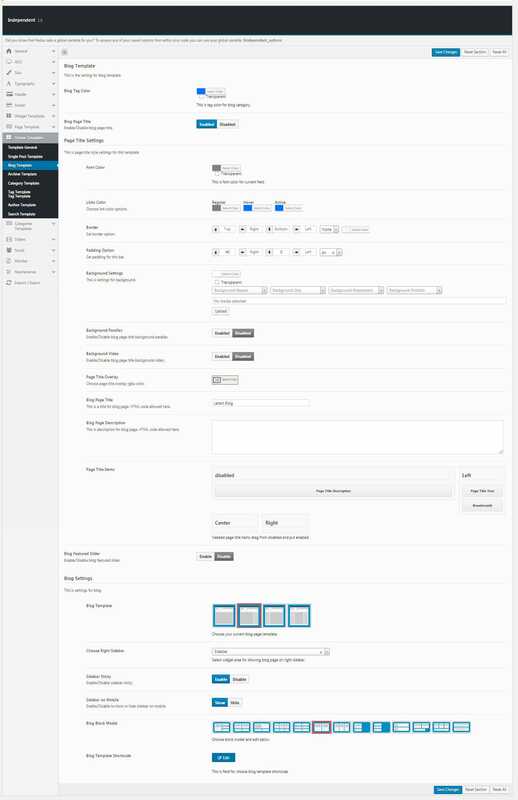 Blog Template Shortcode: This is field for choose blog template shortcode.